Lucideon is home to the largest and most sophisticated high-temperature water corrosion facility in the world. 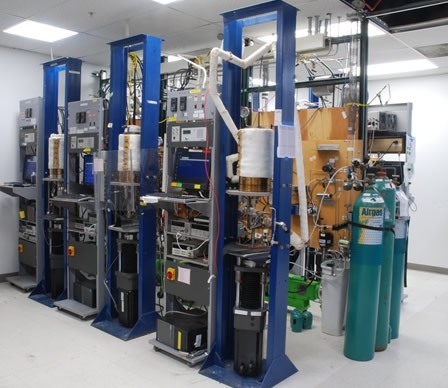 Through its prior association with GE Global Research, the lab has amassed over 10,000,000 hours of Stress Corrosion Cracking (SCC) testing experience in a variety of environmental conditions, including BWR and PWR nuclear applications. Housed in a dedicated facility are thirty-two computer-controlled servo loading systems, with capability up to 250 kN. Each stand is equipped with a high-temperature autoclave with excellent temperature control, a closed loop water chemistry control system, and a high-resolution DCPD crack growth measurement system. An extensive support infrastructure provides a stable and reliable testing environment, which is critical for SCC testing. Multiple power control and backup systems include a large central uninterruptible power supply (UPS) on all critical electrical systems, backed up by an emergency diesel generator with automatic transfer in the event of power failures. Additional systems include a building-wide tempered water system to ensure thermal stability of the aqueous test environment, and centralized distribution of gases and ultra-high purity water to all systems. Lucideon's other on-site capabilities provide “one-stop shopping” for design and execution of complete testing programs – from test engineering and specimen machining to post-test evaluation and interpretation. Supporting material characterization services include SEM-EDS, EBSD, metallographic, chemical, mechanical, metallurgical and microstructural evaluations. Technical direction of SCC testing at Lucideon is provided through an association with some of the foremost independent experts in the field: Dr. Peter Andresen, Dr; Larry Nelson, and Dr. Xiaoyuan Lou. With their combined experience of over 100 years of SCC testing at GE Global Research, the close collaboration between these experts and Lucideon has established Lucideon as the “gold standard” for SCC testing across the world.